Now that she is a year old I'm ready to stop breastfeeding her. That's what I keep telling myself anyways. 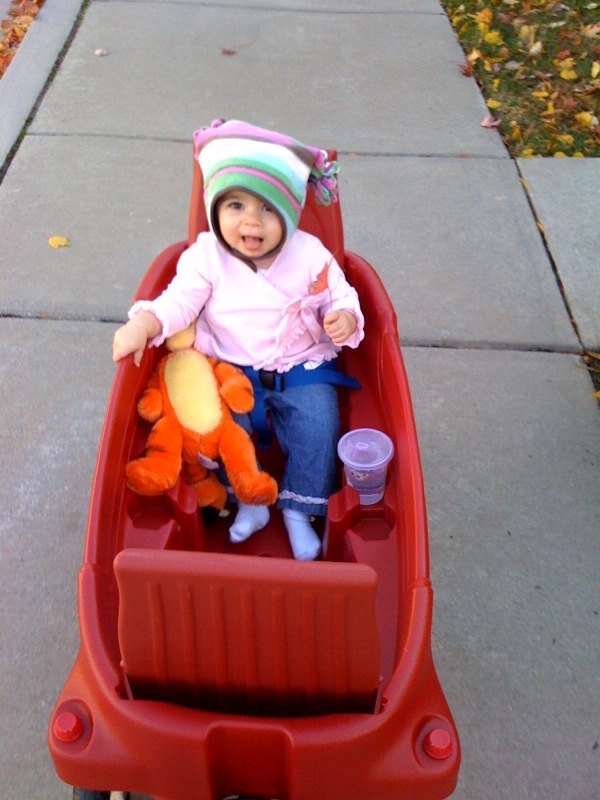 When I first brought her home, it was always my intention to supplement with formula every so often - mostly to give myself a break. Well that never worked out for us. I have tried formula several times in her first year and my picky little peanut has always gagged on it. I continued to pump breastmilk and we tried to give her a bottle once a day until she was about 6 months and she decided she'd rather starve than take a bottle. Since I am a stay-at-home-mom and she always took well to the breast, I decided I would continue through her first year. Around 8 months, as she began to eat more solids I would cut out several of her feedings and give her a sippy cup instead. She took to the sippy really well! (In fact, last week she graduated from a sippy with handles to a sippy without handles. I was watching my friend's daughter who is 3 and she had to drink like a big girl too!) At around 9 months I dropped her afternoon "snack" feed, and was now just feeding her first thing in the morning, before each of her naps, and at bed time (and sometimes in the night, to comfort those teething pains). I think I am ready for be done breastfeeding. I'd like to have my body back to myself for a little while. However, I kept telling myself that she wasn't ready to wean, she couldn't handle it, etc. Today I thought that I was taking a huge step by cutting out her feed before her morning nap. I was prepared for her to lie in her crib screaming, tears rolling down her cheeks angry at mommy. I was prepared to silently sob in the hallway while the guilt wrenched inside my stomach. But... I put her to bed and she didn't even notice that she didn't nurse. She hugged me, cuddled up with her Sammy (seahorse) and went to sleep. So now I'm realizing I'm the hold up. I do want to be done nursing, but I'm having such a hard time letting go! I never ever ever in a million years thought that it would be such an emotional journey. I'm so glad that I did it though. I think my plan is to keep skipping the late morning feed for the rest of the week, and to cut out her afternoon feed next week. If anyone has any advice I'll gladly accept it. I know that I don't have to stop nursing, and that many moms nurse well into the second year and beyond, but I do feel like the time has come for me to quit. We have had thrush numerous times, and a month ago AJ got her first ear ache, which led to her refusal of nursing on the left side no matter what position we try, so I'm beginning to look a little lop-sided! Haha. Good for you for sticking it out for a whole year! I nursed Dom for 8 months (introduced formula @ 6 mos.) and exclusively nursed Cam for a whole year, too (he never had formula). Once he hit 11 months, he was down to 3 nursing sessions per day and I had a freezer full of stored breastmilk, so I eliminated the mid-day feeding first. After a couple weeks or so, I eliminated the night-time feeding (that was a tough one!) and kept the morning feeding for another week or so. I nursed him for the final time on the morning of his 1st birthday (I had a goal, can you tell?!) and he never looked back. It was an easy transition for him...tougher for me! Slow weaning is best because you won't have to worry about engorgement. Good luck! That is great that you breastfed the whole 12 months! I'd go pretty gradually, but I think once you're down to 2 feedings, depending on the quantity she takes at those feedings, even if you stopped cold you wouldn't get very engorged. The dropping one feeding a week like you are doing is the best way, I think...then again I've never been able to nurse for a year. I'm with you, lingering at 2 feeds at 13 months...morning and night. I dropped the nap feeds one week at a time too. Night time is next. I know she can handle it because the other night she went without and slept fine. Good luck to you! Congrats on breastfeeding for so long! Nate is 15 mo and we're at 3 a day, so I don't have any advice from personal experience. I can certainly relate to how emotional it can be though. Every time I thought Nate would mind dropping a feeding, he really hasn't seem to notice! I interviewed a lactation consultant recently for an examiner.com article about weaning toddlers. She had a bunch of good tips. One of the tips was to not offer the breast at the feeding you are dropping, but not refusing either. She said refusing the toddler when they ask can make for a needy, clingy baby. She also recommended a book - Mothering Your Nursing Toddler (I think that was the title). Good luck! You've given her an awesome gift and you should be really proud of yourself! Way to go breastfeeding for so long! It can be a tough thing to accomplish with so many obstacles! We are down to 4 a day so I don't have much advice. Avery wants to nurse more then that but when she asks I try to distract her with other things. I have heard that gradual weaning is the best. Good luck!